Our researchers Pere Ridao and Marc Carreras are currently in Rome in the Workshop on EU Funded Marine Robotics and Applications (EMRA 2014). 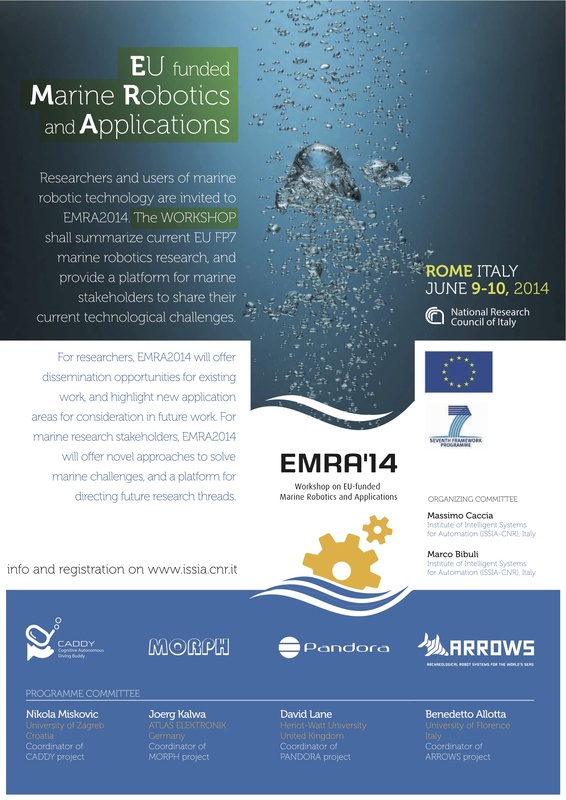 Researchers and users of marine robotic technology are invited to EMRA2014. The workshop shall summarize current EU FP7 marine robotics research, and provide a platform for marine stakeholders to share their current technological challenges. For researchers, EMRA2014 will offer dissemination opportunities for existing work, and highlight new application areas for consideration in future work. For marine research stakeholders, EMRA2014 will offer novel approaches to solve marine challenges, and a platform for directing future research threads. MORPH project will be presented today at 14h by Antonio Pascoal from IST-ISR and PANDORA project will be presented tomorrow in the afternoon by Marc Carreras.